This is not a drill: Sicario 2 is on its way, and today has brought us a title and teaser. In Sicario 2: Soldado, the drug war on the U.S.-Mexico border has escalated as the cartels have begun trafficking terrorists across the U.S. border. To fight the war, federal agent Matt Graver (Josh Brolin) reteams with the mercurial Alejandro (Benicio Del Toro). 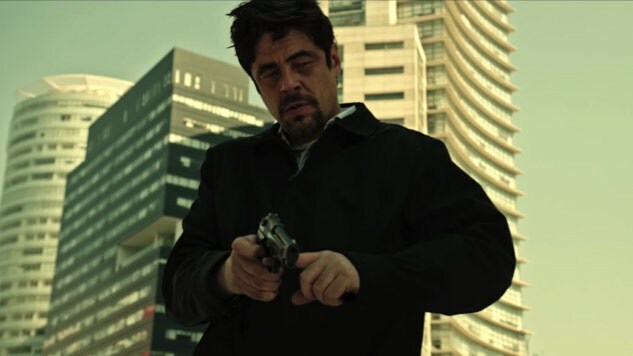 That’s right: Del Toro’s show-stealing badass of a Sicario character is going to war with “everyone” in the sequel to Denis Villeneuve’s acclaimed drug war drama. Get excited. Sicario 2: Soldado (“soldado” meaning “soldier”) also stars Isabela Moner, Matthew Modine (whose voice can heard in the teaser), Jeffrey Donovan, Manuel Garcia-Rulfo and Catherine Keener. Unfortunately, Emily Blunt won’t be reprising her role as F.B.I. agent Kate Macer. Villeneuve and elite cinematographer Roger Deakins won’t return for the sequel, either, but Del Toro spoke highly of Soldado director Stefano Sollima (Suburra) in an interview with EW. Sicario scribe Taylor Sheridan wrote the sequel’s script. The next chapter of the Sicario saga opens June 29, 2018. Watch the first teaser below.